It wasn’t a typical Thursday night for me. Instead of my usual routine of organizing my collection of beer bottle caps while listening to Kenny Rogers, I headed off to the fights. 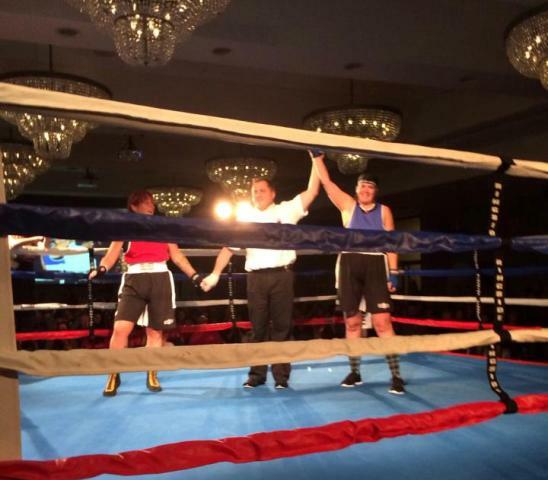 The event was The Clean Fight — a fundraiser for iDE-Canada, organized by In This Corner (ITC) Boxing Fitness Centre. 14 women raised over $5000 each for the privilege of subjecting themselves to intense training 5 days a week for 3 months, culminating in an actual honest-to-goodness boxing match. One of these brave-slash-crazy women is a good friend of mine, Mavis “Mayhem” McRae. This is only one of many adventures for this globe-trotting, ocean-saving, entrepreneur; but it was “the toughest” (she wrote on Facebook, as she nursed her sore ribs). You can read all about her experience at mycleanfight.wordpress.com. The event itself was very well done. 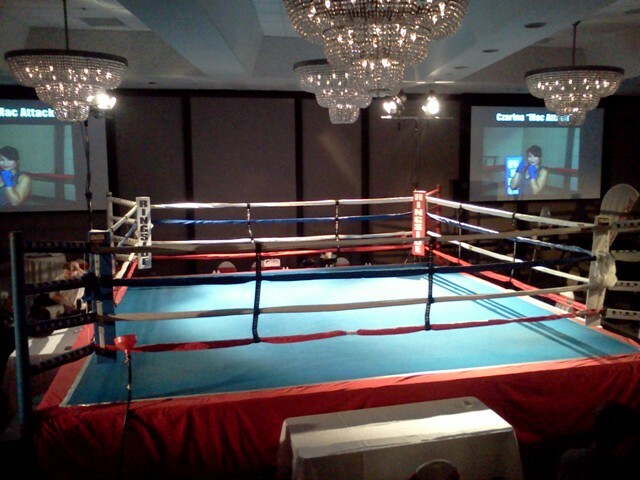 It was held in a ball room at the Radisson Hotel in downtown Winnipeg, with free appetizers (14 to choose from – each named after one of the fighters), big screen TVs encircling the room, live entertainment between rounds, hunky firemen *swoon* letting us know what round was coming up, and of course: a bar! 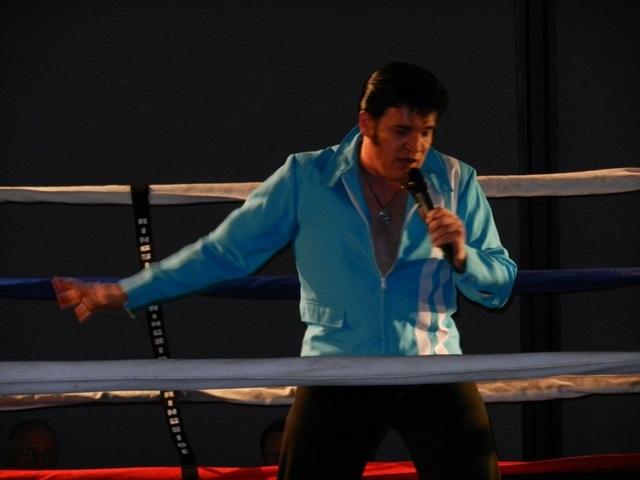 The live entertainment was … affordable … but hey, Elvis was there! Elvis was pretty good, actually. My friend Ronny can do an Elvis impersonation to rival anyone, but this fellow had the vocals down and put on a good show. All that was fine, but the night was about the boxing. This was no Bud Babes Boxing like they used to have at the now-torn-down Monty’s bar. These were official matches, sanctioned by the Manitoba Amateur Boxing Association (or whatever athletic body sanctions boxing matches. I assume that’s the one.) The fighting was intense, and the crowd was noisy, and it was a pretty awesome experience. Mayhem Mavis had her hands full with Lindsay “The Knock Out” Lecker (who happens to be my optometrist’s daughter, proving once again how Winnipeg can be such a small city some times.) How did she do? See for yourself! At the end of the evening my buddy Mavis was a champ, all seven matches were entertaining, all boxers were okay, and all the fans had a good time. Even better, over $100,000 was raised for iDE-Canada and the primary cause of the event: improving sanitation in developing countries — a problem that restricts the economic potential of a population, endangers vulnerable people, reduces dignity, and in many cases leads to disease and death. Not bad for a Thursday night. coming over again to read аdditional newѕ. valuable info to work on. You’vе done a formidable jօb aոd our whole community will be grateful tο you.